Friday night launched off in the activity hall at 8 pm with games to get us familiar with each other’s names, and getting to know each other. We always love a mixture of brand new participants and seasoned CISVers, so beginning camp this way gives us an opportunity to bond before continuing onto the rest of camp as a team. After names games, we made our placemats for the weekend. We use this as another opportunity get familiar with each other, and then we mix up the placemats every meal time to make sure we all have a chance to talk with different people throughout camp. After completing our placemats we went off to get ready for bed, grab some biscuits and a drink of water for supper, and then gathered back together in the activity hall from our ‘wind down’ time singing a few lullabies together. At 9.30 it was lights out, ready for a big day on Saturday! This entry was posted in Auckland Chapter, JB, Mini-Camp, News. Friday began with a name game to get to know everyone. This included everyone coming together to greet returning campers and meeting the new ones. Some were team activities, and some were competitive! Saying your name twice then someone else’s name twice takes on a whole different meaning when you can’t show your teeth and are trying your best not to laugh. There was a whole heap of teeth shown, that’s for sure! 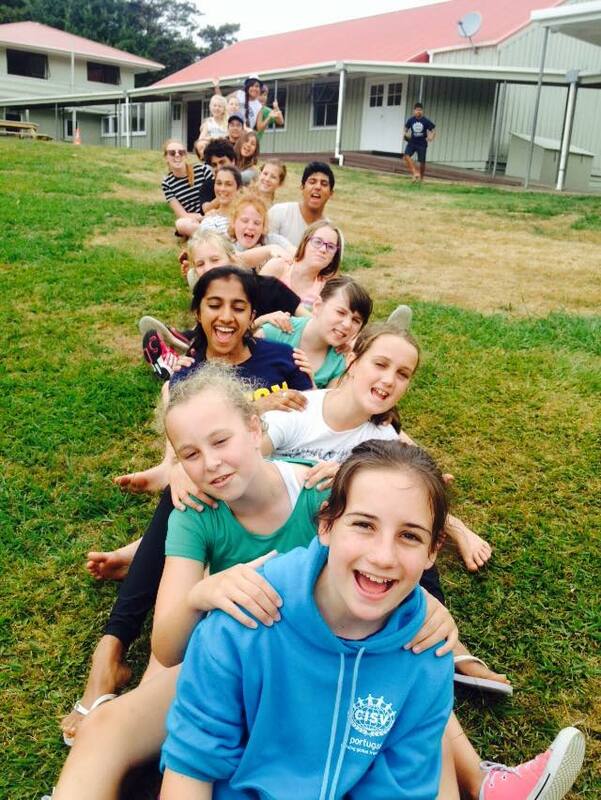 It was during the Friday evening that the camp leaders were introduced; Gemma, Tracey, Mackenzie, Ellen, David, Aiden, Tess, Danni, Heba (Whanganui) & Jamie (Christchurch) coming up from down south to join the fun. Afterwards, participants made their unique placemats with their names. They were then randomly assigned to tables for meals, and people needed to sit by their placemats. This system got everyone to mingle, meet new people and allowed for some great conversations. One of the things on the placemat this camp was a picture of your two favourite animals combined into one. A bird moose or Boose, a Unigon (Rainbow Unicorn Dragon) were just a couple of crazy designs. At the end of the night, lullabies and bed drew everyone to bed with the leaders evaluating the day and making sure tomorrow would be awesome. Soooo tired – must sleep now! As it was my first time enjoying a CISV minicamp naturally, I was shy. I didn’t expect to fit in straight away, as some of the kids have been lifelong members of CISV. How wrong I was. I was not left out in a single activity and had loads of fun. At the camps and mini-camps, there are many songs and dances such as kitos, flag and others. In fact flag (a song) is sung by every single camp and minicamp all over the world from Chile to Australia. One of the many unique things about CISV is that the adults aren’t even in charge half the time! A team of 14-year-olds and over (known as the JB’s), come up with cool activities like wacky energizers and mind boggling decoding. But don’t go thinking the adults didn’t do much, in fact without the kitchen team slaving over a hot oven, no food would be served, and without our wonderful team leaders, the whole camp would just not connect. The June CISV minicamp was an exciting adventure I’m glad I went on, and I hope I can enjoy many more adventures with the leaders, the cooks and fellow kids. 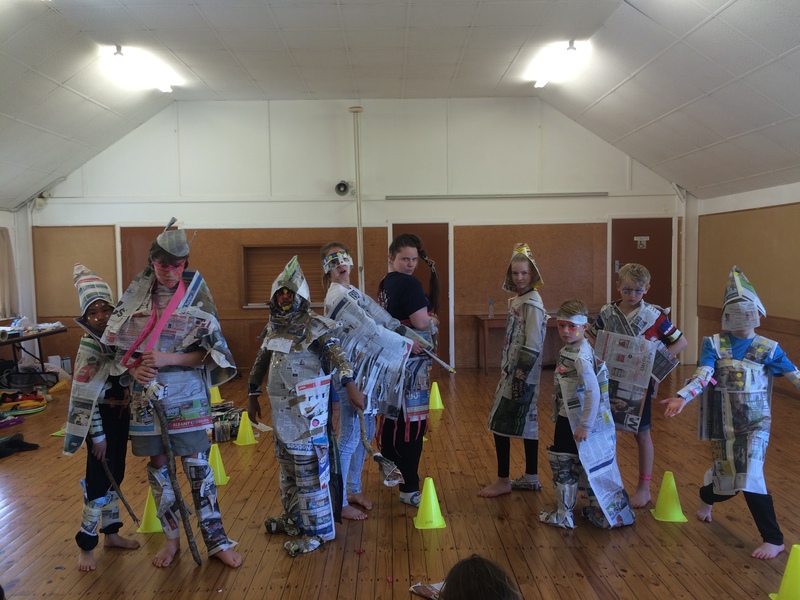 This camp was themed Superheros, and over the course of the weekend we were able to participate in activities to develop our super skill of Conflict Resolution, which is the CISV Content Area of 2015. We started off with energisers to get us working enthusiastically together as a united group, both new participants and seasoned CISVers, and then went into some name and getting to know you games. Then we moved onto the designing of our place mats. Every minicamp we make placemats with our names and interesting things about us (such as our favourite food, sport, or what we want to do as a job), so that we can get to know each other during meals times by seeing and talking about each others interests. Minicamp started off as always with excitement, name and getting to know you games. We had so many kids this time it was important to play a lot of name games so that everybody could remember each others names. Then we designed our own placemats based on a range of questions like: what kind of super hero do you want to be? and what do you want to be when you are older? These placemats will then be used during meal times for the rest of camp. This enables us to sit with new people and have fun questions to ask about each others placemats. After a quick snack and drink its time for bed. Everybody gets into their PJs and we sing a mixture of Oasis and Taylor Swift songs together CISV lullabies style. Then comes bedtime. We are all still very excited but need our rest for the action packed next day. We started off on Friday night with some name and getting- to- know you games, and then moved into making our place-mats for the next day. At each minicamp we arrange the tables for meals by spreading out named place-mats, so that at each meal we have an opportunity to speak to different people, and interact with the JB’s, kids, and leaders.